So the topic here we are going to discuss is about the home security. The question that might pop into your mind after this could be that why one needs to have home security at the first place? The answer is simple, because of the ever increasing rate of crime and to provide protection to those you love and to your property. According to the report generated by the FBI, in every 20 seconds, a burglary is happening in USA, which means too much insecurity for the people. Hence it is important to consider the factors that can add security and provide safety to you. When we see the number of burglaries taking place in USA, we find that a big percentage of them is based only upon the domestic ones, which means that the homes need to be secured well too. When a home gets victimized by the burglars, the people living in the home feel more insecure, more exposed and more open to the world and the effect of the incident hardly leaves their minds. Here we are going to discuss the factors that can provide or strengthen the security around your home and make it a better and safer place to live in. therefore you need to pay special attention to all these factors and try to implement them at your home or office. The first thing to consider is to understand the fact that how these burglars strike, so that you get alert to their ways and can put a stop to their actions. Most of the burglaries happen in the dark of the night so you need to be more prepared and more alert for it as the darkness spreads. Secondly you should try to double the security at night to make sure you stay safe. Locking the doors and the windows properly not even in the day time but also in the dark of the night will help you put a big stop to the burglars trying to enter your home through these two places. Another great tip is to make it clear that you are at home. A dull and gloomy looking house is more likely to invite the burglars to attack it compared to the one that is fully lit and has signs of people inside it as well. Even if you are not at home, leave the lights turned on, leave a clean car in the porch and try playing some music or sound in the house as well. Making use of the security gadgets for the home security is also essential. There are so many different type of the cameras available in the market that you can use in order to make sure that the burglars don’t come in and if they do, they sure get recorded on the camera to be later dealt with. These were our simple tips, once you start following these, you will find your home to be more secure and a better place to live in as well. Now we are going to present a review of the security camera that can help you with catching the burglars or best scooting them away. The security cameras play a vital role in putting a stop to the amount of burglaries taking place in a specific area. For example, consider a home that has put a security camera right at the front door of the house. now when the burglar will try to get into that house, he will get to see the camera and there is a huge chance that he would be simply leaving the house as no criminal would like to get himself recorded for the police to find them. On the other hand, if the burglar still tries to attempt the theft, the camera will record the footage that would prove to be an evidence for the police during the investigation, help them find the people responsible and get you the criminal. The insurance companies also tend to provide you with the compensations based on these videos of your home security system. So we see that it never hurts to get a camera installed to your house for the safety and security purposes. This camera that we have selected for the review for you is the one that belongs to Amazon and is surely available at Amazon.com as well. This camera has been rated as one of the best cameras on amazon.com and is known for its perfection. Let us have a look at its salient features. This camera has an amazing feature that helps it make you get aware of any motion or activity taking place in the area where you have planted the camera. this helps you a lot as not a single activity is missed and you know what is going on around as the cloud camera sends a message alert at your smart phone device regarding it. The cloud camera is specially designed to strengthen the home security for you, so that whenever you are away from home, you stay connected to the house and the happenings there all the time. All this is possible with this cloud camera, a wireless network and a smart device. The camera is also equipped with the eight infrared lights that help the camera see in the darkness as well and as clear as in the day time for up to 24 meters. Also these lights are capable of viewing in the wider field of vision, not just in the spot light. So you need to worry about the security concerns in the dark of the night. Another great feature of the cloud camera that helps enhance the home security for you is the two way audio feature. This feature helps you communicate on the other end of the video be it your baby who is wailing badly, a dog that is refusing to eat at all or just some intruder whom you want to alert for being caught in the act. As we have discussed earlier that the cloud camera is capable of sending the alerts to the phone you have to notify you of the activity going in the house, you can also specify the alerts you want to receive only as the camera has artificial intelligence as well. for example if the camera keeps notifying you of the moving plants but you get distracted due to them and you want it only to notify you if some person enters the vicinity, then you can set that too for the camera and get those alerts. The camera is a simple DIY one that can easily be installed all by yourself as it does not require a lot of technicalities and engineering. All you have to do to get this home security camera to start working for the home security system is to plug this device to the power and start it, get it connected to the wireless network and there you are, turn it on and after giving a few more step details, you will start getting the alerts from the camera at your phone. Till now we have kept talking about the security and safety concerns of the homes only but you would be glad to know that these cameras can be used for the surveillance and security of the offices and commercial buildings as well. Especially at the times when the offices have been closed and there is not one behind to check, the cameras can record the activity and provide and evidence the next day. The camera also allows you to have a look at the status and happenings of the camera and the house anytime, anywhere. All you need for this is the high speed internet that can get you linked to the camera easily. Now that we have seen all the features, let us have a look at the pros, cons and conclusion of this cloud camera for you. 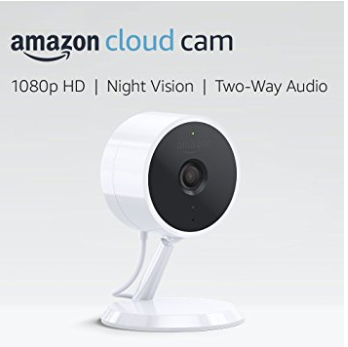 If you want the home security of your house be enhanced and you need to out some camera for surveillance in there, then the best option you can have for your house is the cloud camera by Amazon. This camera won’t ask you to spend a fortune on it to purchase it but the results that it will provide you will be worth the price. With so many amazing features and literally none reported troubles, this camera is a worth buying one.